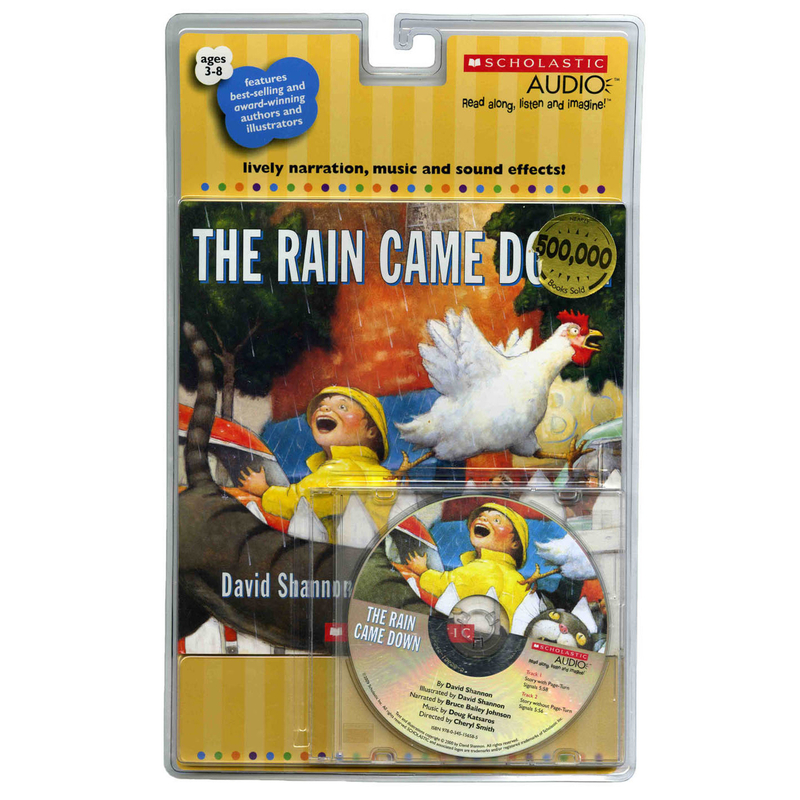 The Rain Came Down - Audiobook | Listen Instantly!
" Skylar actually selected to purchase her own copy of this after having it out from the library. " " The illustrations were great, but the story wasn't really well thought out. But still fun. " " I can honestly say that I am one of those people who gets very grumpy and mean on rainy days because the rain makes everything wet and dirty and I don't like that. This book is about how a rainy day causes chaos in a town. When the rain stops everyone is nice to one another. Students can have a discussion about how they feel when it rains outside and how they feel when it is sunny. The way in which Shannon wrote this story was pretty neat. He started out with one mood and switched to another by the end of the story. I would challenge my students to write stories that make a person feel one way at the beginning, but another way at the end of the story. " " Read this one with a very interactive preschool crowd - adding finger movements (for down came the rain), fist shaking (for arguing), sound effects (for animal sounds) and amazingly without being cued pure silence! Great fun! Excellent pictures. " " Great read aloud. Reminds me of the Give a mouse a cookie books. " " David Shannon is so fun. This a great book to use for storytimes especially since we live in Seattle. Kids love the pandemonium in this story and the colorful illustrations. Wear rain boots and have the kids shout all the fun sounds and funny things the characters say. " " I love David Shannon. This book is full of huge and wonderful illustrations. The story is cute and has a good message. The line "and the rain came down" is repeated often. Great for read alouds. " " I love the chaotic feel of the book. I love all David Shannon books. This book has great illustrations that show unique views. We talk about sensory images and the descriptive language in the book. This is also a good beginning, middle, end book. " 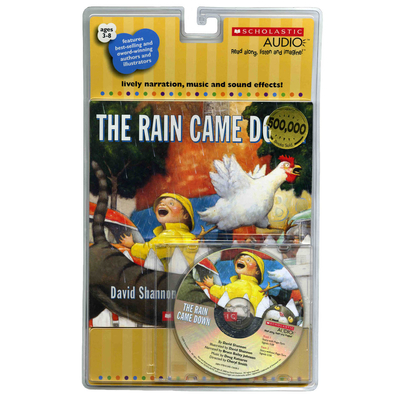 " This is a fun book about a chain of events that occurs one rainy day and the "calm after the storm" once the rain stops. It's a good book to read aloud to children, with the inimitable cartoon style of David Shannon. " " Age: K, 1, 2. Fun, over-exaggerated take on the grumps that can happen on a rainy day. Also, can do some fun cause-effect discussion and predictions as to what will happen next. " " good book to use when talking about cause and effect! " " The rain is creating chaos and making everyone in the city, irritable and grouchy until it stops . . . "
" This book shows people mood changes when there is rain. I used this book in my classroom when I my students where looking at David Shannon's books. The students compared and contrast David's other book to this book. " " Very cute and colorful. Lots of 'professions' "
" This is a great cause/effect relationship book! It contains many examples of cause and effect in a fun way. Also, every child can relate to rain and how it can sometimes cause traffic (especially in Atlanta!) and other problems. " " Good examples of cause and effect for young students. Can also be used to discuss weather and what may happens when it rains. Overall good book for young students. " " This is an interesting little story of cause and effect, as the falling rain caused accidents and arguments in a town, but when the skies cleared, moods lifted and business returned to normal. I enjoyed the illustrations as well. " " Silly story but I enjoyed the way it showed how we are all interconnected. Was asked to read it again multiple times! " " My son loves this story. The pictures are beautiful, and the story is simple, yet advanced enough to teach prediction. " " Story about how the rain causes chaos, but I like the rain. Great illustrations though. Picture Book "
" Anyone looking for a good gift book for anywhere from age 2-6 this is a fun book. The illustrations are lovely, and the story is enjoyable even on repeated readings. " " The kids love this book especially when it is raining outside. " " This was such a cute book with great illustrations. This would be great to use with sequencing and repetition. One bad thing after another happens while it is raining. Then it suddenly stops and all is resolved. " " a good early reader and good to read out loud "
" I didn't really like this book but my 2 1/2 year old keeps requesting to read it so apparently it does appeal to the little ones. " " I like this book because the pictures are very colorful. I also like the way the author use different characters to present different meanings. In the story the rain really did come down. " " This book is a great book to use when you are talking about rain. It shows a picture of what people can get like when it rains and how their mood changes once it gets sunny again. Great book that kids love. " " Good examples of cause and effect for young students. Can also be used to discuss weather and what may happens when it rains. Overall good book for young students.
" It's funny how the weather has a huge impact on our moods and personalities. Shannon displays the calamity and ruckus very well. It's a cute story with a happy ending. " " This book is about the effects of rain. When lousy event leads to another and another and another. But, when the rain clears up, and the sun comes out, everyone's mood instantly changes and everyone is willing to help one another. " " Cumulative tale, nice cause and effect. " " Great for sequencing and ordering. Story builds while "the rain came down". " " good book to use when talking about cause and effect!